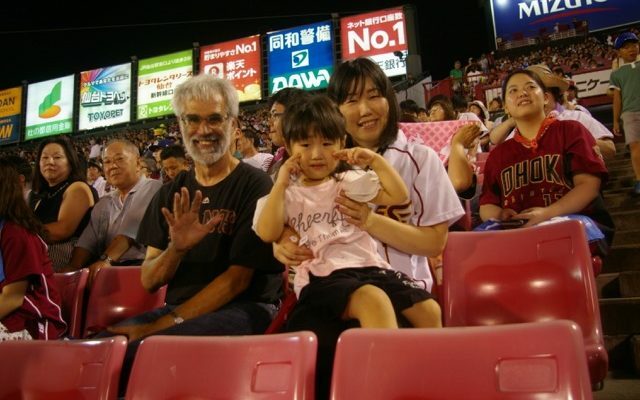 The TWG blog is a great place to share what we know about baseball, so let me share something about how our sport works over in Japan. And hopefully convince you it is there sport now too. Writing this has also given me a chance to read a little history, and to look at my old pictures. History: I’ve used the internet while writing this, to learn more of the history. Baseball is yakyuu (野球, field + ball), and was introduced in 1872 by an American teaching in Tokyo. You can still see where this happened! I always stop to watch for a few minutes whenever my weekend walking expeditions pass by a stadium. One time, a Japanese guy who was also watching some high school play came up to me and said ‘you know, this is the spot of the first baseball game in Japan’. It is the first field, just on your left, a short ways after you enter Ueno Park from the nearby train station, en route to the museums or cherry blossoms or zoo (pandas!) or temple remains found in this very large must-see park. High school and college and some professional baseball were established prior to World War 2, helped by a 1934 tour of Japan by players like Ruth and Gehrig, led by Lefty O’Doul (SF Seals and NY Giants). The Tokyo Giants took that name in 1935 because of O’Doul’s role in popularizing baseball in Japan. Professional ball survived into World War 2, at a reduced level just as in America, with only 1945 lacking any kind of season. The website https://www.tofugu.com/japan/japanese-baseball-history seems to be both extensive and accurate on the history. It can teach you about Wally Yonamine from Hawaii, or Masanori Murakami who pitched for our Giants in 1964. While on paper sumo is Japan’s national sport, baseball sells the most tickets and creates the most passion. Amateur and professional: High school baseball is fanatical, capped by two annual tournaments held at Koshien Stadium, which is a hallowed ground like Wrigley Field or Fenway Park. Hanshin Tiger’s professional games get moved to downtown Osaka while the high school tournament is played, and the tournament is shown on national TV. College baseball is dominated by a league in Tokyo, where private universities can afford to give out scholarships (our Nori Aoki once played for Waseda University). Most good players from high school try to go pro, directly, into the Nippon Professional Baseball league. The NPB is divided into two leagues, Central and Pacific, each with 6 teams. The Central league is usually stronger and does not use the DH, and the Pacific is conversely. There is some interleague play now. The winner in each league meets in the Japan Series, typically overlapping with our World Series. Spring training is also about the same time as ours, and occurs on Okinawa and Kyushu Island. Two things about the NPB may be interesting. The national champion is determined by a playoff scheme now. The 2nd and 3rd team in each league play a best-of-three series, with that winner going into a best-of-seven round (Climax Series) against the team with the best regular season record. This #1 team starts with one “win”, so only 6 games are actually played. Besides the automatic one game edge, the best record team is resting its pitchers during the first round, so they often are the team that advances to the Japan Series. This seems like a good idea to me, the regular season record really counts. The Japan Series is best of 7 between the two league champions. Another difference is that a tie can occur in the regular season. An extra inning game that goes 12 innings becomes a tie. This lets people catch the trains home, before they stop running about midnight, and is considered a fairly satisfactory outcome since there’s no loser. There are semi-pro leagues. Shikoku Island has four teams in such a league, including the Kochi Fighting Dogs, who had Manny Ramirez on their roster for a year. There are two organized minor leagues, “Eastern” and “Western” which play 80 games per year, for NPB’s player development. And if you walk around on Saturday morning, just about anywhere, you’ll come across middle or high school age guys practicing. NPB teams: I’ll use city or region names, not the companies that own them, for example my favorite team is the Fukuoka Hawks, rather than Softbank Hawks. But you do have to learn the company names to understand how the teams are known over there. One thing is quite tricky. A major newspaper chain, the Yomiuri Daily, owns the Tokyo Giants. These guys’ uniforms look exactly correct, down to an interlaced Y/G in orange stitching on black caps. However, this team is much more equivalent to the Yankees – they buy up the best players, act like it is their right to win every year, and are on TV far too often. Most Americans end up pulling for someone else. Nagoya’s Dragons wear blue use a big script D with underlined, upward sloping letters to spell out the rest of their name. Barf! There are some established rivalries, for instance, so as a Hawks fan I naturally look for glorious victory against Saitama prefecture’s team, the Lions (think Cards/Cubs). But I’m also starting to be fond of Sendai’s Golden Eagles. The Hanshin Tigers who play near Osaka in fabled Koshien Stadium are the rivals of the Tokyo Giants. This team is a bit like the Cubs, often being not very good, but with fanatical fans – they do win every dozen years or so, which is celebrated by their fans going down to a channelized river in downtown Osaka, where they jump off a bridge into the filthy water. It is hard to understand. I was once taken to a restaurant near that spot, which put up a clown outside when open for business, but showed two clowns if the Tigers win. Back in 2007, I was meeting some university students, who’d been told before the little get together that I liked baseball. I still remember Emiko, a die hard fan of Tokyo’s Swallows (who usually have a losing record) telling me that one has to be passionate about one’s team. She’s right, passion is the exactly correct word. Go Giants! Quality of play: NPB is not quite but pretty close to MLB, so a number of their players have succeeded in the US. They practice a lot, so they can almost always get a bunt down, and fielding errors are fewer. There are home runs, but the players are not quite as strong as Americans, so they are playing NL-style small ball. I like that, but even in the early innings, the strategy is often to play for one run, rather than a big inning. The product on the field is the real deal, in other words, but what happens in the stands is charmingly different, as you’ll see next. Stadiums and fans: I’m still trying to get to a game in all of the stadiums, but have a few to go. These range from large ugly soulless domes (Sapporo, Osaka, Nagoya) to nicely sized outdoor stadiums (Hiroshima and Sendai). Saitama prefecture’s Lions play in what started out as an open air symmetrical field, which is now topped by a lid – but there are no sides, just a roof, so it feels like outside in the summer. 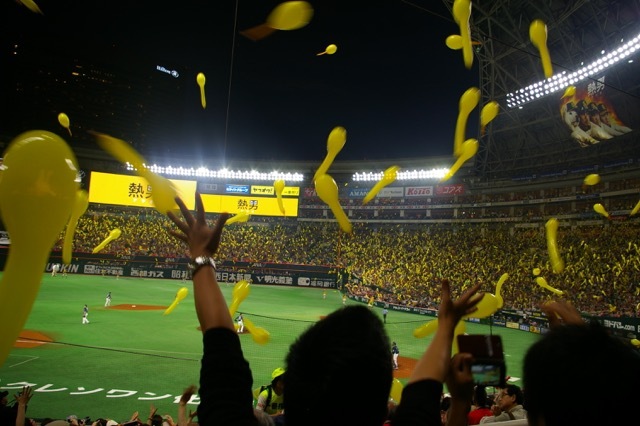 Fukuoka’s Hawks play in a stadium that can close the roof, and they did that for no apparent reason except perhaps to demonstrate how that worked during the 8th inning of a game I attended. Japan is rainy, so the majority of the stadiums are covered. An iconic example is “the Big Egg”, for its white dome (officially called the Tokyo Dome), where the Giants play. I’ve never been to a game in there, but have gone to its small baseball museum, whose doors open onto the outside plaza, and which admits visitors throughout the year. I think this is as close as they come to Cooperstown (not very close at all), but you get some idea of the history (not much English on the signage). Lions’ home stadium, where one can see out into the countryside. It feels like summer, but the game can’t be rained out. This is the first game I ever saw over there, back in 2000 (picture using film, later scanned to a computer). 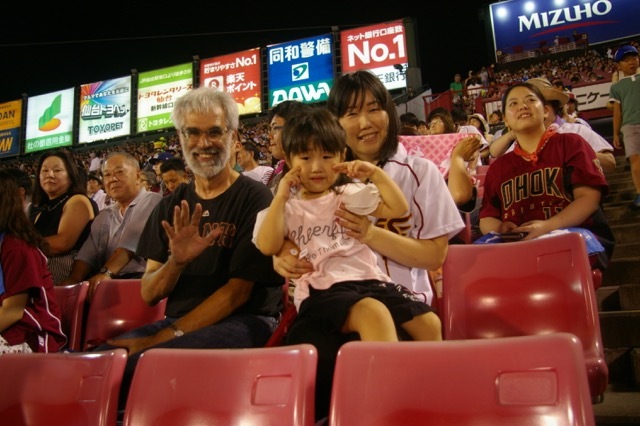 Fans are very good, especially those I saw cheering the Hiroshima Carp, but everywhere. Japan is small enough for the visiting team to always have followers, so there’s a convention of sitting on the 1st or 3rd base side to show your loyalty. 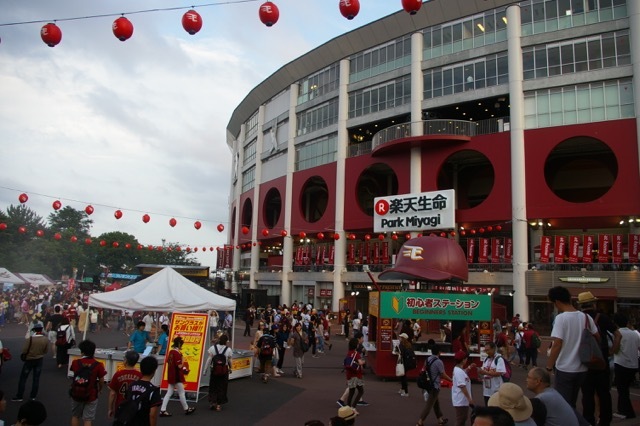 Golden Eagles’ charming open air home stadium (Sendai is the capital of Miyagi prefecture), with pre-game activities. 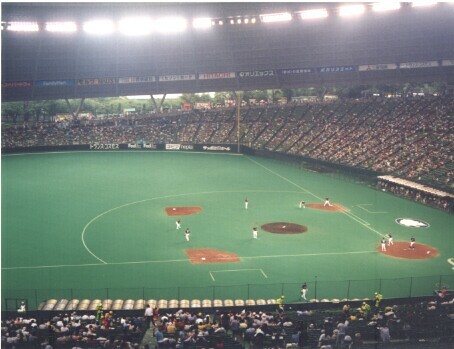 The other really nice undomed park is Zoom Zoom Stadium in Hiroshima. The nuttiest fans form a band, which always sits in the outfield, to wave flags and play fight songs. You can cheer by banging on sticks (which is unpleasantly noisy) or just silently hold up a cloth sign with the name of the current batter. Or, like most people, chant the batter’s name, as in “Otani, ganbatte”. During the 7th inning, many home town fans will have blown up a balloon in team colors, to be released simultaneously during the inning break. Balloon launches are a newish phenomenon, and are now answered by the visiting fans having brought their own balloons from home, to shoot off in the previous inning. Freebies are thrown into the crowd, and there are goofy mascots, and big screen images of people in the crowds, and lots of very pretty girls leading cheers throughout the game. At the game in Fukuoka, there was a woman who wore Lion’s ears. Fun stuff. Balloon release in support of the Hawks. Ball park food. I’m sure you could find a hot dog, and usually there’s KFC. But why bother with that, when there’s grilled fish, onigiri, edamame, or yakitori to choose from? Soft drinks and ice cream are carried around the seats by vendors. But my favorite is the beer girls (I think I’ve seen only two beer guys). Take a fairly small and pretty young girl, and put a big insulated backpack on her, holding a miniature keg. Wouldn’t you want to buy a beer (700 yen), just to help lighten her very heavy load? All the national brands are available. 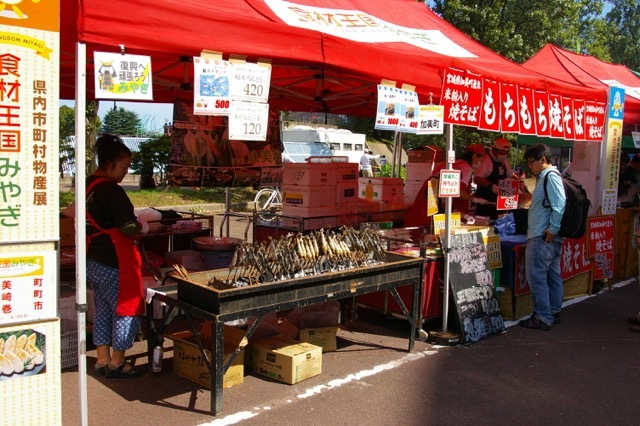 Food vendors outside Sendai’s stadium. If you don’t like grilled fish, get yakisoba at the next booth over. Tickets. Note that the home team is listed first on the schedules you can easily find online, or else you’ll be in the wrong city! I wish I was better at this. Once I walked up to the ticket counter at the Nagoya Dome, just before the game started, which is probably OK, as most of the time the stadiums don’t sell out. But selecting a good seat seems easiest at Ticket Pia, a company with many locations that sells tickets for all sorts of events, like concerts. They can show a chart of the stadium to point at for your desired seat. Ticket Pia has a booth right in Narita Airport, so you can get your ticket at the start of a trip. 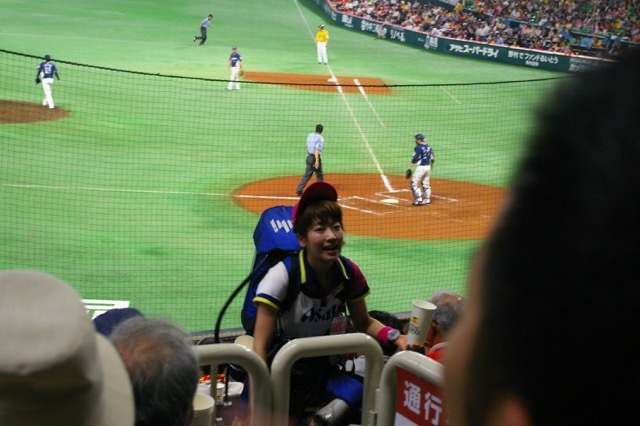 Asahi beer girl, in the Hawks dome, with the Lions preparing to start an inning. Once upon a time, when I had a very good agent at one of the Japanese travel companies, I could get a ticket of my choice sent to my hotel, for convenient pickup at check in. I don’t really know how to trigger that by myself, but it is the perfect system. Rakuten, who own the Golden Eagles team in Sendai, decided last year to sell their own tickets only through their own huge internet website, whose ticketing pages were unfortunately entirely in Japanese. Luckily, my trip last fall was shortly after a young lady who was a student in my sister’s small town some years ago had reconnected with my sister on the Facebooks. My sister was once in a program to sponsor overseas high school students, although she was not the home host of this particular person, who is now married to a marketing guy for the Golden Eagles. So I got a very good seat for free, and was able to meet my sister’s friend and her charming daughter. Alas, the Eagles played very poorly that night.